It was simple to throw together, and MEGA flavorful….I think. See, I have this cold…so I’m not sure I’m tasting it 100%. Nonetheless, we both loved it — it will go into the rotation! We served it with tortilla chips, but it would also be delicious with cornbread, I think! – Heat the oil in a large pot over medium high heat. – Add the chicken and chopped onion and saute for about six minutes, or until the chicken is seared and the onion is translucent. – Add the garlic and cook for another three minutes. 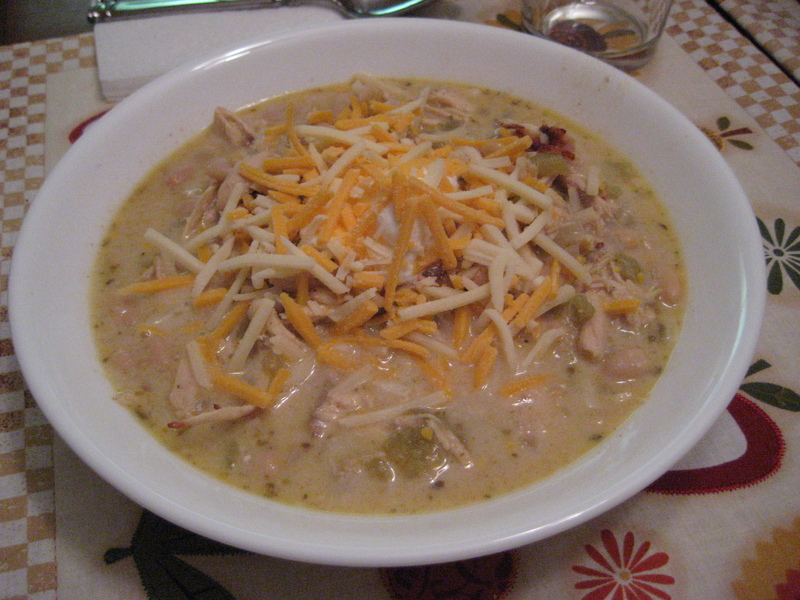 – Add the beans, spices, chicken broth and green chilies and bring to a boil. Reduce heat and simmer for thirty minutes. – Turn off the heat and add the sour cream and half & half. Serve with cheddar cheese and additional sour cream to top.